Lifesong Photography & Designs had the pleasure of traveling to Alaska last summer. Although some time has passed, I have finally found the time to share with you some of the images which were captured in an effort to always remember what I saw and how my breath was taken away. and starting the days with equally lovely colors will never fade from my memory. While I traveled, my eyes were opened. The snow-capped mountains in the distance paired with the wildflowers blooming amongst me made such an impact. The idea of something having fertile enough ground to blossom while in a climate like the one Alaska is known for took me by surprise. Such a perfect opposite of the mountains in Hawaii, we enjoyed wearing some layers and doing a cooler-climate hike to Exit Glacier. Congratulations to Kylie, the senior I photographed there! She has recently graduated and is one her way to making her place in this world. I feel so blessed to be a part of these cherished moments. Thank you, Brock family! This year has been one of Lifesong’s most diverse years yet! From the monuments of Washington D.C to the quaint roads and villages of Europe, I am astonished with what I have been blessed to capture in the first couple of months of 2018! Travel has always been a part of my hobbies and certainly a big part in making me into the photographer I am today. However, if you would have told me I was traveling world-wide for sessions and to seek out photography opportunities, I never would have believed you! I have known Sophie for well over a decade and had the opportunity to meet her wonderful boyfriend, Sam, when I traveled to England last month! Amongst the castles, the farmsteads and the unique towns, we walked the woods and enjoyed the architecture of a bridge centuries old. Because of people like Sophie and Sam, the time in Europe was incredibly relaxing and meaningful. I cannot wait for the next Europe trip. I can only imagine what it will be – third time is a charm, right? When someone hires me to do a lifestyle session, I literally do a happy dance. When Destiny suggested that her lifestyle session be at the beach followed by a hike to the Lanikai Pillboxes, my excitement went through the roof. An afternoon starting at the beach and ending at sunset overlooking the Pacific, and I get to call it my job? I am SURELY livin’ the dream. Destiny is a fit and fierce woman who can take on anything. …and she certainly took that challenge head on. Enjoy the little video below of our adventure to the second Lanikai Pillbox at sunset. Enjoy your ALO][A Friday and thank you for stopping by! Be sure to “share” and comment if you like what you see! 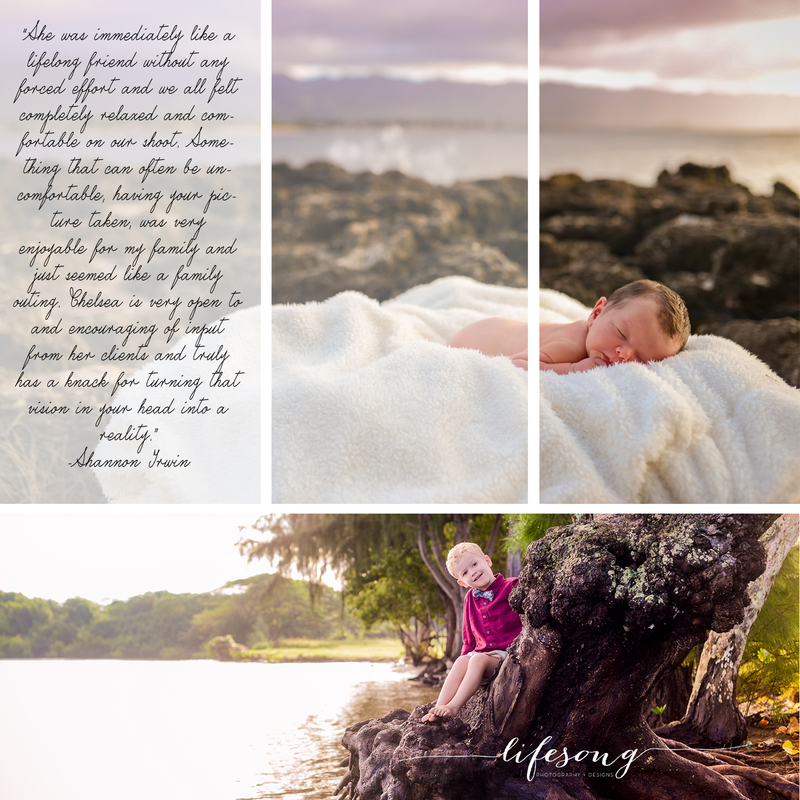 Email me at Chelsea@Lifesongdesigns.com for your Lifestyle session! Senior sessions are notorious for being ‘over-thought’ and ‘over-worked’. I aim to grab those stunning shots for everyone to hang on to: grandma, grandpa, mom, dad, the boyfriend and the best friend. In doing so, I also focus on not letting too much get in the way. How to get the best session? Only focus on the parts that are vital. This allows a little extra time to play and nab the unconventional shots because you aren’t worried too much about the additional things which can create stress and unnecessary work. 3. Surroundings which are symbolic to the senior. 4. A relaxed style look with a maximum of two other looks. 5. A background which needs very few props — if any at all. Some might say that there is no such thing as “picture perfect”. I disagree. There certainly is. Any family, couple or individual who is willing to step forward and be themselves without hesitation IS “picture perfect”. The Parker family is just that. It was a very cold morning, but even through the brisk air, I could feel the warmth of their smiles as I looked through my lens. Their hearts were open and ready to share the joy with one another. I was able to give very little direction and in what I consider the best shots, I felt like I was witnessing something so very rare; true love. This family had love for one another, love of being together and love of experiencing life…no matter where that journey took them. Don’t get wrapped up in “your best side” or what you might think is your biggest flaw. Those issues will fade into the background, per say, and the interactions will shine through. Next time you are worried about being “picture perfect” remember, very little has to do with what you are wearing or even where you are. The energy, the soul and the perfection of those images are found at their core — the raw emotion which lingers through the session. Thank you, Parker family, for giving me this time with you. It was my honor! !